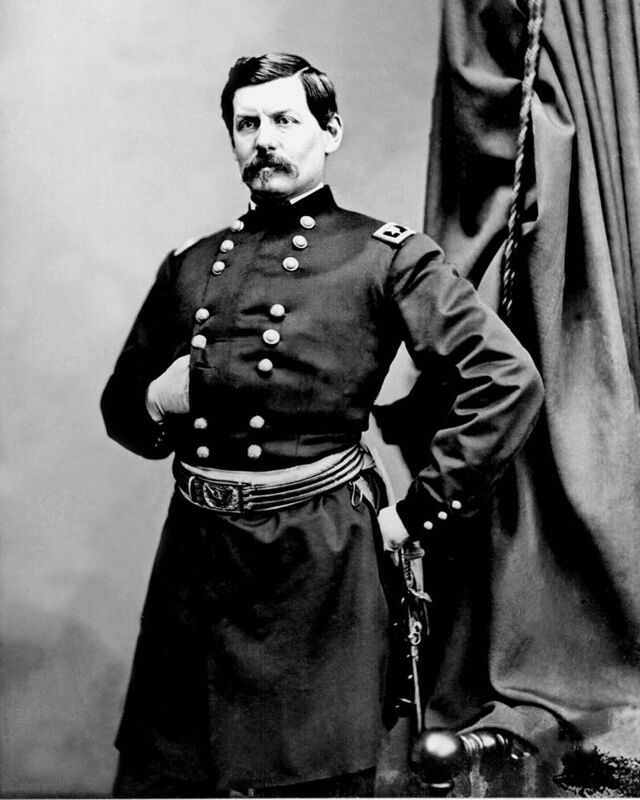 George Brinton McClellan (December 3, 1826 - October 29, 1885) was an American soldier, civil engineer, railroad executive, and politician. A graduate of West Point, McClellan served with distinction during the Mexican-American War, and later left the Army to work in railroads until the outbreak of the American Civil War. Early in the war, McClellan was appointed to the rank of major general and played an important role in raising a well-trained and organized army, which would become the Army of the Potomac; he served a brief period (November 1861 to March 1862) as general-in-chief of the Union Army. Although McClellan was meticulous in his planning and preparations, these very characteristics hampered his ability to challenge aggressive opponents in a fast-moving battlefield environment. He chronically overestimated the strength of enemy units and was reluctant to apply principles of mass, frequently leaving large portions of his army unengaged at decisive points. McClellan organized and led the Union's army in the Peninsula Campaign (also known as the Peninsular Campaign) in southeastern Virginia from March through July 1862. It was the first large-scale offensive in the Eastern Theater. Making an amphibious clockwise turning movement around the Confederate States Army in northern Virginia, McClellan's forces turned west to move up the Virginia Peninsula, with the Confederate capital, Richmond, as their objective. Initially, McClellan was somewhat successful against the equally cautious General Joseph E. Johnston, but the emergence of General Robert E. Lee turned the subsequent Seven Days Battles into a Union defeat. General McClellan failed to maintain the trust of President Abraham Lincoln. He was insubordinate to his commander-in-chief and privately derisive of him. He was removed from command in November after failing to decisively pursue Lee's Army following the tactically inconclusive but strategic Union victory at the Battle of Antietam, and never received another field command. McClellan went on to become the unsuccessful Democratic Party nominee in the 1864 presidential election against Lincoln. The effectiveness of his campaign was damaged when he repudiated his party's platform, which promised to end the war and negotiate with the Confederacy. He served as the 24th Governor of New Jersey from 1878 to 1881. He eventually became a writer, and vigorously defended his Civil War conduct. Most modern authorities have assessed McClellan as a poor battlefield general. A few historians view him as a highly capable commander whose reputation suffered unfairly at the hands of pro-Lincoln partisans who made him a scapegoat for the Union's military setbacks. After the war, Ulysses S. Grant was asked for his opinion of McClellan as a general. He replied, "McClellan is to me one of the mysteries of the war."